Student loan fraud occurs when identity thieves obtain personal information and use it to apply for federal student loans and Pell grants. It can happen to anyone, whether you attend college or not. College students are four times more likely than other groups to have their identity stolen by people they know, including roommates, family members, and friends. Phishing email attacks are also on the rise at colleges. 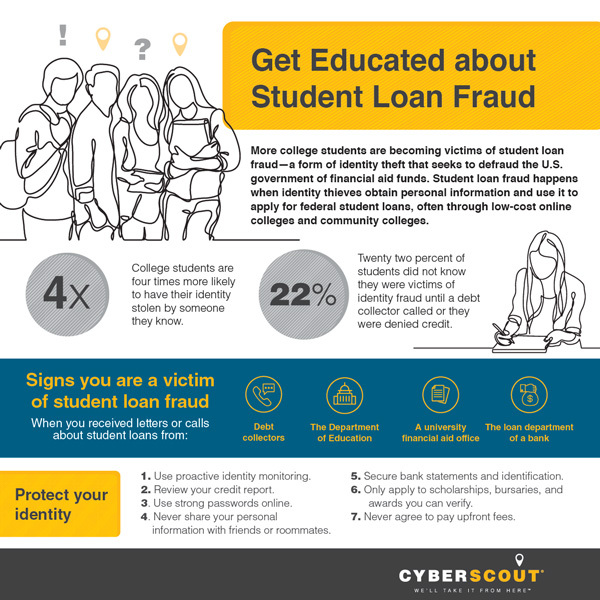 Perpetrated by rings or individuals, student loan fraud most often involves a ringleader and several accomplices posing as “students.” Using stolen personal information, accomplices enroll in classes at a college or university and apply for financial aid. With online enrollment and distance learning options, thieves never have to set foot in a registrar’s office or classroom. The U.S. FAFSA system is particularly vulnerable to fraud because financial aid does not require a credit check. Once financial aid is approved, the school receives the money and subtracts out tuition and fees. The remaining balance is disbursed to the “student” for living expenses. Thieves target schools that charge low tuition, such as community colleges and online universities, because more money is left over to steal. After cashing out, they drop their classes, leaving victims on the hook for repayment. Advanced fee scams offer to find better interest rates or consolidate multiple loans in exchange for an upfront fee. Students can consolidate for free at StudentLoans.gov. In the law firm scam, a student is referred to a law firm and asked to make loan payments to the firm while a debt settlement is negotiated. The firm doesn’t make the payments and default occurs, ruining your credit score. The debt elimination scam promises to get your loans eliminated, but discharge is not possible unless you have a qualifying reason (such as identity theft, death, or disability). In the scholarship scam, a person claiming to represent the U.S. Department of Education calls and offers you a scholarship or grant if you provide a bank account or credit card to pay a processing fee. If you receive letters or calls regarding student loans, don’t just dismiss them because you do not have any student loans. Someone else may have taken out loans in your name. Suspicious calls from debt collectors, financial aid offices, or banks should alert you to dig deeper. If you receive a disbursement letter from a university, someone is receiving money in your name. If you have become a victim of student loan fraud, you need to act swiftly and decisively to resolve the fraud and protect your identity and credit from further damage. Seek help early. It can be difficult, confusing, and frustrating trying to resolve identity theft on your own. For expert guidance, find an identity theft resolution service. Review your credit report for other fraudulent loans. Identity thieves may have targeted other universities or taken out credit cards and consumer loans in your name. Dispute errors on all three reports. Request a 90-day fraud alert to be added to your credit report with all three major credit reporting agencies — Experian, Equifax, and TransUnion. Report the identity theft with your local police department and get a police report. You should also file a complaint with the Federal Trade Commission. Contact the college or university that opened and disbursed the loan. Provide documentation they may need, including a copy of the police report. Request immediate closure of the loan and get written verification for your records. Contact the lender who originated the student loan. This will usually be the Department of Education, but in the case of a private loan, could be a bank or credit union. Ask for a discharge of the fraudulent loan. The U.S. government will discharge loans obtained fraudulently through identity theft, once you provide the appropriate proof. Don’t share your Federal Student Aid (FSA) ID with anyone — scammers can use it to open loans. Secure your personal information such as student id, social security card, and bank and credit card statements, so that friends and roommates do not see them. Use secure passwords online. If schools or banks contact you about student loans you did not apply for, pay attention and take action. When companies contact you about services on your existing student loans, do not agree to pay upfront fees and remember that a Department of Education seal doesn’t mean the company is legitimate. Student loan fraud and scams are on the rise. Find out how to protect yourself by steering clear of scams and following the tips in this full infographic. Content provided by CyberScout through a partnership with Diamond Credit Union. Diamond members can contact any branch for more information or assistance in connecting with CyberScout’s Resolution Center. 1 “College Students Face a High Risk of Identity Theft,” Consumer Reports, Aug. 4, 2017. 2 “Fraud in the News,” Fraud Magazine, January 2018. 3 “Student Financial Aid Fraud is a Big Problem,” Huffington Post, Feb. 2, 2014. 4 “Recent Financial Aid Fraud Case May be Just the Tip of the Iceberg,” The Student Loan Report, Jan. 4, 2017.